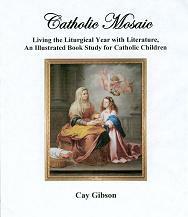 My pre-ordered copy of Catholic Mosaic arrived in the mail yesterday. It was love at first sight. It is a good sized 8 1/2x 11 and has a sturdy spiral binding. I love that it lies flat while reading it. Cay Gibson, the author, quotes John Donne in her acknowledgements and since he is my favorite poet, she had me at hello. Cay has used the Liturgical Year to highlight a few great picture books per month. While not all of the books are strictly Catholic in content they all reflect the virtues, truth and beauty that parents want good literature to convey to their children from the earliest ages. Cay has made each book study so easy for the parents by including vocabulary lists, copywork, discussion questions, a variety of enrichment activities and a parents help page for each book she highlights. Included in each month are books for which there is no book study but will round out the reading for the month. I have to mention the Appendixes as well. Cay has added so much depth to the book with the lists and resources in the back, that alone is worth the price. There are outline maps to help with geography studies, lists of prayers, and lists to help integrate the books studies with Seton Art and Catholic Heritage Curricula’s wonderful book A Year with God. This book lends itself to so many applications. You can begin a beautiful Liturgical Notebook with your children, you can lapbook each book or if you are a scrapbook person that would also be a beautiful presentation of the new knowledge. If you teach religious education this book will also be a lovely resource. Cay is obviously a woman who loves her faith, literature and children. Hats off to her for sharing her wonderful talent and making this beautiful resource available to Catholic homeschoolers.